Botox® Cosmetic is a simple, non surgical, physician-administered treatment that can temporarily smooth moderate to severe frown lines between the brows in people from 18 to 65 years of age. One 10-minute treatment—a few tiny injections—and within days there’s a noticeable improvement in moderate to severe frown lines between the brows, which can last up to 4 months. Results may vary. Botox® Cosmetic is a purified protein produced by the Clostridium botulinum bacterium, which reduces the activity of the muscles that cause those frown lines between the brows to form over time. Prescription Dysport® is an injection used to temporarily improve the look of moderate to severe frown lines between the eyebrows (glabellar lines) in adults less than 65 years of age. With 1 injection into each of 5 points between and above the eyebrows, Dysport® stops the signal from the nerve to the muscles, ultimately resulting in a reduction of muscle activity and temporarily preventing contraction of the muscles that cause frown lines. The untreated facial muscles still contract normally, allowing you to freely show facial expressions, such as smiling, in untreated areas. You should not be treated with Dysport® more frequently than every 90 days. 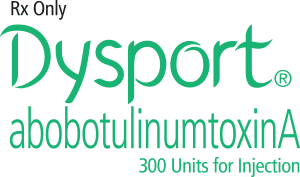 Dysport® is a purified formulation that has been shown to deliver temporary improvements in moderate to severe frown lines, even with repeat treatments. XEOMIN® is a non-invasive cosmetic treatment made of botulinum toxin type A that can address moderate to severe frown lines between the eyebrows. This product uses a fine needle to inject the solution to the face where wrinkles have developed. While XEOMIN® does not permanently eliminate frown lines, it minimizes muscle movement, so frown lines do not show when making certain expressions. XEOMIN® is long lasting, but patients may need to undergo repeated treatments every three to four months to maintain the best cosmetic results.